Manchester United will pocket more money in TV and Prize money from this year’s premier league campaign compared to 2017-18 champions Manchester City. 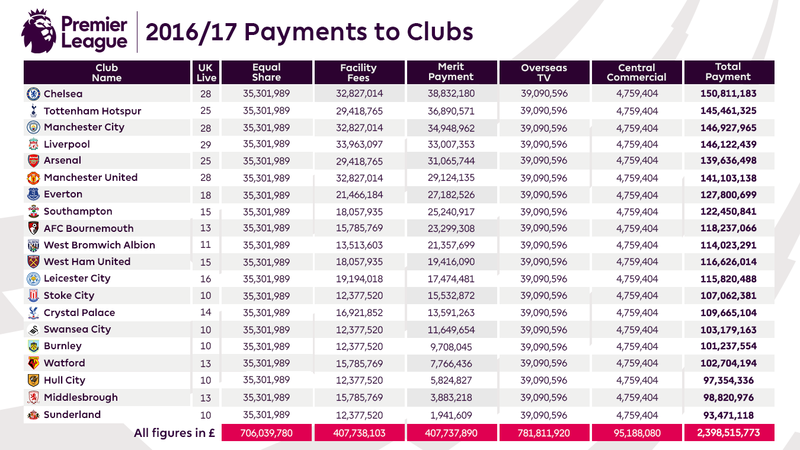 Premier League revealed the official breakdown of TV money for 2017-18 season and below are all the details on how it is distributed and which team go what. Manchester City earned less than Manchester United in the premier league TV and Prize Money even after winning 2017-18 premier league title. City got £149.4 million while United will pocket slightly more £149.8 million. 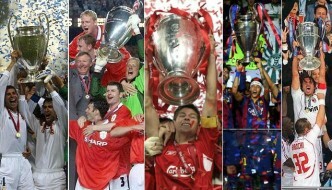 United also became the first team to earn over £1 billion in TV money since 1992. 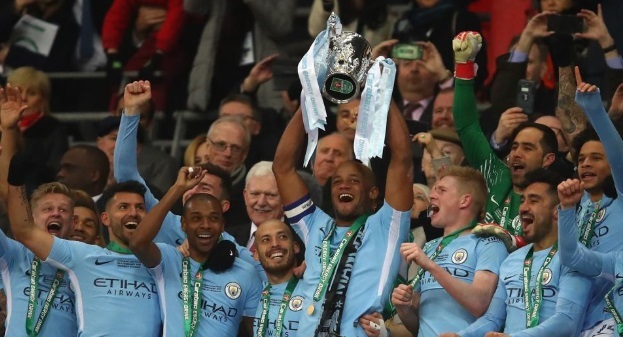 Premier League has confirmed the TV money distribution and prize money for 2017-18 season and the eventual winners of this year’s premier league title will take home more than £150 million. While the bottom club is also set to take home around £100 million. Manchester United are set to pocket the most money largely down to the fact their matches are shown live more times than any other team. We take a look at predicted premier league table and how the TV money will be distributed among 20 top flight clubs this season. Last season Chelsea were paid £153.2 million as part of premier league TV money allocation and this year’s winners can expect the same numbers. 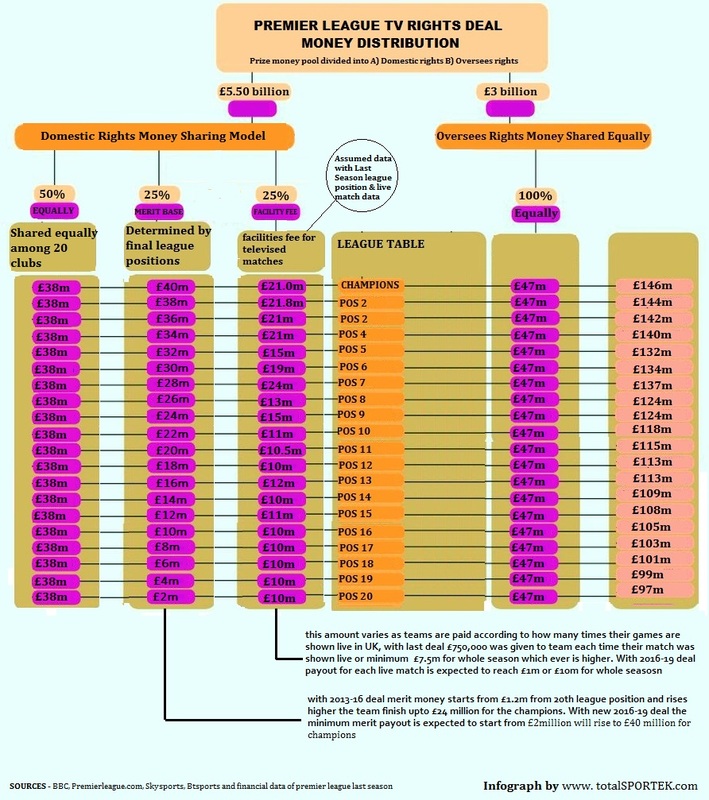 Below is the entire breakdown of how Premier League distribute funds to 20 top flight clubs and 2017-18 season tv money table confirmed by English FA and Premier League. 2017-18 will be the last season under record breaking three year TV deal which made Premier League the most lucrative football domestic league in the world. 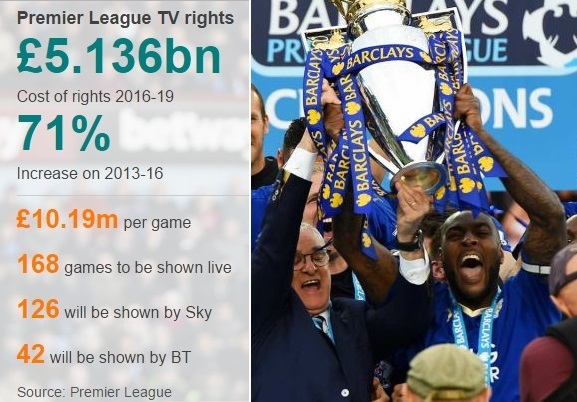 SkySports and BT Sports shared the broadcasting rights of Premier League in the United Kingdom for the last three years with a huge £5.136 billion deal signed back in 2015. Premier League also signed massive oversees tv deals around the world which took the total TV income to more than £8.5 billion for last three year period. These new TV deals ensured Premier League clubs massive financial downfall from 2016-17 season where even the club finishing bottom of the table will earn around 100 million a year. We take a extension look how the premier league prize money is distributed and the possible prize money for all 20 positions in the league. Current premier league deal was signed back in 2015 which turned out to be the most lucrative TV deal in history of football worth £5.136 billion from domestic rights alone. Oversees packages included and Premier League had a £8 billion windfall over three years period. 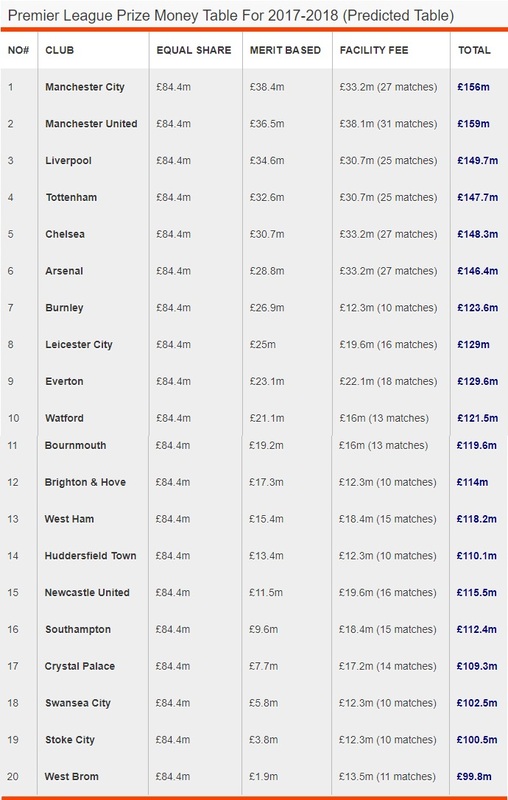 Lets take a look how the TV money is distributed every season under the current deal. Premier League Prize Money Pool For 2017-18 Season: So the total money from both domestic and oversees three tv deals combined is around £8 billion. Which will be divided into three parts making prize money pool for each of the three seasons under the current TV deal period. Thats around £2.6 billion a season to be distributed among premier league clubs (part of it will be used as parachute payments to relegated clubs). So the prize money pool for 2017-18 season will be around £2.5 billion and here is how the distribution model works in premier league. 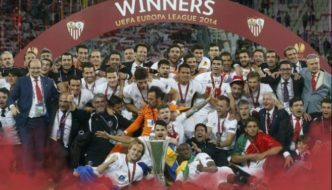 The domestic portion of the money will be divided among 20 clubs according to following model. Oversees tv money is divided equally between all 20 clubs and for 2016-17 season all premier league clubs will get around £47 million each from this portion. So now we know how the TV money is distributed among 20 teams and since we know all the main numbers in TV deals we can pretty much predict prize money table for 2017-18 season. We take the live matches data from last season while league position are from 25 February 2018..
* just click on the table image below and it will go full-screen where you can zoom in/out. 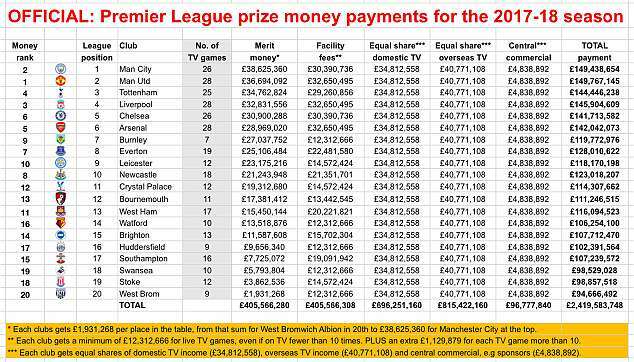 Last year Chelsea won the premier league and with that took home just over £150 million in the TV money. Bottom club Sunderland earned £93.4 million for their 2016-17 campaign which saw them get relegated into Championship. We can expect the same numbers across the 20 teams again only difference will be the number of times team’s matches have been shown live in 2017-18 season. Absolutely brilliant! As a Watford supporter looking forward to the next season with a new manager and another 100m quid in the bank couldn’t be happier. MEANS UNITED HAS MADE MORE MONEY FROM THE COMPETITIONS THAN ALL THE CLUBS IN EPL..
what’s the prize money for the champions league, Europa league and English FA cup. 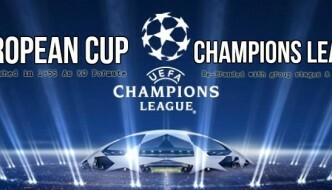 what’s the prize money for the champions league, Europa league and English FA cup and,English championship prize money? I go to see day-to-day some websites and blogs to read articles or reviews, however this website presents feature based posts. 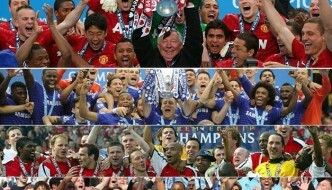 more money in the league,but highly peform in champiom league.